Media captionMay on being "bloody difficult" and "Brussels gossip"
Theresa May says she will be a "bloody difficult woman" towards European Commission president Jean-Claude Juncker during Brexit talks. The PM revived a line used during her Tory leadership campaign to respond to claims the two clashed over dinner. She also declined to commit to settling the issue of expats' rights by June. EU sources claim UK misunderstanding of the talks process, and ignorance about how Brussels works, could lead to no deal being agreed on the UK's exit. According to German newspaper Frankfurter Allgemeine, the prime minister and Mr Juncker clashed last Wednesday at Downing Street over Mrs May's desire to make Brexit "a success" and whether the issue of protecting the rights of expat UK and EU nationals could be agreed as early as June. 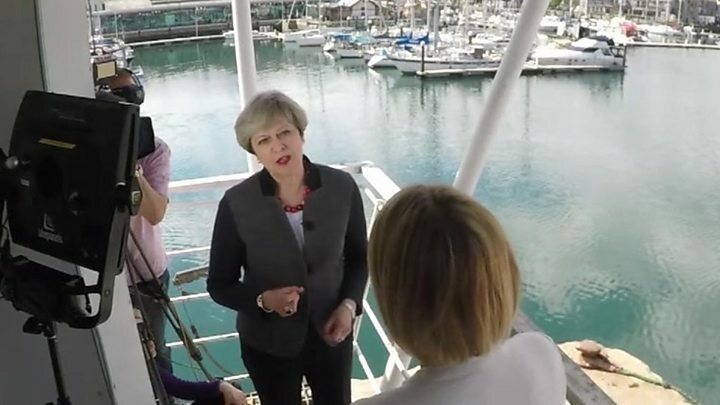 Speaking to BBC political editor Laura Kuenssberg, Mrs May said there were a lot of similarities and common ground in the two sides' positions. She added: "But look, I think what we've seen recently is that at times these negotiations are going to be tough. "During the Conservative Party leadership campaign I was described by one of my colleagues as a bloody difficult woman. And I said at the time the next person to find that out will be Jean-Claude Juncker." The "bloody difficult" quote came from former Conservative chancellor Ken Clarke, who was recorded discussing her after a TV interview last year. Asked about the German newspaper report, Mrs May said: "I don't recall the account that has been given of the meeting that took place, I think that a lot of this is Brussels gossip." But she said that the talks would be tough and would involve either her or Jeremy Corbyn lining up for the UK against the other 27 EU leaders. Theresa May's comment is revealing about her strength, and also her weakness. No political leader wants to be seen to be pushed around. When the UK talked tough as a member of the EU the others had no choice but to listen. But now the UK is on the way out, the incentives for the others to pay attention - let alone do our bidding - is very different. Refusing to be pushed around is one thing, refusing to show any sign of compromise or listen quite another. 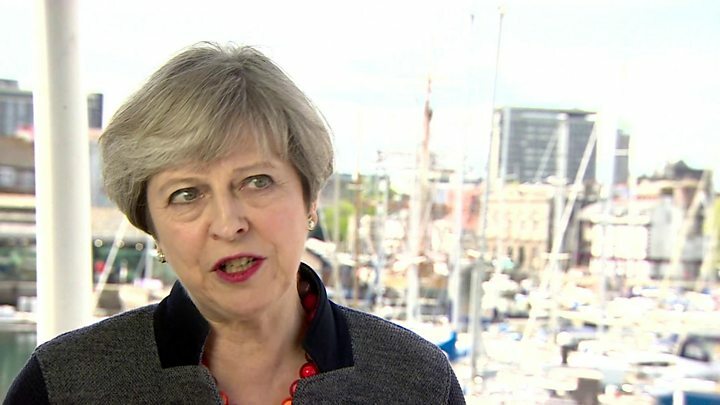 Pressed on whether she did believe the issue of the rights of EU nationals in the UK - and Britons abroad - could be settled in June, she said: "I've always said that I want this to be an issue that we address at an early stage." "I've always said that there are complexities to this issue and lots of details that will need to be agreed. What people want to know is to have some reassurance about their future. I believe we can give that at an early stage. I've got the will to do this," she added. She also said she would have "no intention of doing anything other" than serving a full term until 2022 if she wins the 8 June general election. Opposition parties have accused the Tories of pursuing a "hard Brexit" strategy, with the PM insisting no deal is better than a bad one and planning to withdraw the UK from the EU single market. The first edition of the London Evening Standard published under the editorship of ex-chancellor George Osborne was headlined "Brussels twists knife on Brexit", with an editorial warning the PM against seeking a "blank cheque" from the EU. Launching his party's Brexit strategy, ex-Lib Dem leader Nick Clegg said Mrs May had "chosen to pursue the most extreme and damaging form" of EU departure. He said his party would offer another EU referendum in which it would campaign to Remain.